The following sections provide an overview of the options for identity management and access control in Red Hat Enterprise Linux. After reading these sections, you will be able to approach the planning stage for your environment. This module explains the purpose of Identity Management in Red Hat Enterprise Linux. It also provides basic information about the Identity Management domain, including the client and server machines that are part of the domain. Identity Management in Red Hat Enterprise Linux (IdM) provides a centralized and unified way to manage identity stores, authentication, policies, and authorization policies in a Linux-based domain. IdM significantly reduces the administrative overhead of managing different services individually and using different tools on different machines. IdM servers and clients are Red Hat Enterprise Linux machines. IdM clients can also be other Linux and UNIX distributions if they support standard protocols. Windows client cannot be a member of the IdM domain but user logged into Windows systems managed by Active Directory (AD) can connect to Linux clients or access services managed by IdM. This is accomplished by establishing cross forest trust between AD and IdM domains. Integrate the Linux systems into the environments centrally managed by Active Directory, thus preserving a centralized user store. Easily deploy new Linux systems at scale or as needed. Quickly react to business needs and make decisions related to management of the Linux infrastructure without dependency on other teams avoiding delays. Identity Management (IdM) has a specific purpose: managing internal, inside-the-enterprise identities as well as authentication and authorization policies that relate to these identities. The underlying directory server technology is the same for both Red Hat Directory Server and IdM. However, IdM is optimized to manage identities inside the enterprise. This limits its general extensibility, but also brings certain benefits: simpler configuration, better automation of resource management, and increased efficiency in managing enterprise identities. Knowledge Base article about Standard protocols. Identity Management servers are Red Hat Enterprise Linux systems that work as domain controllers (DCs). In most deployments, an integrated certificate authority (CA) is also installed with the IdM server. Servers are the central repositories for identity and policy information. They also host the services used by domain members. Identity Management clients are Red Hat Enterprise Linux systems enrolled with the servers and configured to use the Identity Management services on these servers. Clients interact with the Identity Management servers to access services provided by them. For example, clients use the Kerberos protocol to perform authentication and acquire tickets for enterprise SSO, use LDAP to get identity and policy infromation, use DNS to detect where the servers and services are located and how to connect to them. Identity Management servers are also embedded Identity Management clients. As clients enrolled with themselves, the servers provide the same functionality as other clients. To provide services for large numbers of clients, as well as for redundancy and availability, Identity Management allows deployment on multiple IdM servers in a single domain. It is possible to deploy up to 60 servers. This is the maximum number of IdM servers, also called replicas, that is currently supported in the IdM domain. Identity Management servers provide different services for the client. Not all the servers need to provide all the possible services. Some server components like Kerberos and LDAP are always available on every server. Other services like Certificate authority (CA), DNS, Trust Controller or Vault are optional. This means that different servers in general play different roles in the deployment. The first server installed to create the domain is the master server. If your Identity Management topology contains an integrated Certificate Authority (CA), this server is the CRL generation master and the CA renewal master: the only system in the domain responsible for tracking CA subsystem certificates and keys and for generating the certificate revocation list (CRL). The CRL generation master role is critical because it is performed by only one server in the topology. For redundancy and load balancing, administrators create additional servers by creating a replica of any existing server, either the master server or another replica. When creating a replica, Identity Management clones the configuration of the existing server. A replica shares with the initial server its core configuration, including internal information about users, systems, certificates, and configured policies. A replica and the server it was created from are functionally identical except for the role of the CRL generation master. Therefore, the term server and replica are used interchangeably here depending on the context. In Red Hat Enterprise Linux, you can manage identities and access control policies using centralized tools for a whole domain of systems, or using local tools for a single system. Each server is administered separately. All passwords are saved on the local machines. The IT administrator manages users on every machine, sets authentication and authorization policies separately, and maintains local passwords. For general information on Red Hat Identity Management, see the Red Hat Identity Management product page on the Red Hat Customer Portal. The following sections provide advice on determining the appropriate replica topology for your use case. Continuous functionality and high availability of Identity Management services is vital for users who access resources. One of the built-in solutions for accomplishing continuous functionality and high availability of the Identity Management infrastructure through load balancing is the replication of the central directory by creating replica servers of the master server. Identity Management allows placing additional servers in geographically dispersed data centers to reflect your enterprise organizational structure. In this way, the path between Identity Management clients and the nearest accessible server is shortened. In addition, having multiple servers allows spreading the load and scaling for more clients. Maintaining multiple redundant Identity Management servers and letting them replicate with each other is also a common backup mechanism to mitigate or prevent server loss. For example, if one server fails, the other servers keep providing services to the domain. You can also recover the lost server by creating a new replica based on one of the remaining servers. Clients interact with the Identity Management servers to access domain resources. For example, clients belong to the Kerberos domain configured on the servers, receive certificates and tickets issued by the servers, and use other centralized services for authentication and authorization. The first server installed to create the domain is the master server. If your Identity Management topology contains an integrated Certificate Authority (CA), this server is the CRL generation master and the CA_renewal_master: the only system in the domain responsible for tracking CA subsystem certificates and keys and for generating the certificate revocation list (CRL). When an administrator creates a replica based on an existing server, Identity Management creates a replication agreement between the initial server and the replica. The replication agreement ensures that the data and configuration is continuously replicated between the two servers. Replication agreements are always bilateral: the data is replicated from one server to the other as well as from the other server to the first server. Identity Management uses multi-master replication. In multi-master replication, all replicas joined in a replication agreement receive updates, and are therefore considered data masters. These agreements replicate the identity information. These agreements replicate the certificate information. Both replication channels are independent. Two servers can have one or both types of replication agreements configured between them. For example, when server A and server B have only domain replication agreement configured, only identity information is replicated between them, not the certificate information. A data center can be, for example, a main office or a geographical location. One Identity Management server can provide services to 2000 - 3000 clients. This assumes the clients query the servers multiple times a day, but not, for example, every minute. If you expect more frequent queries, plan for more servers. Red Hat guarantees to support environments with 60 replicas or fewer. A large number of replication agreements per server does not bring significant additional benefits. One consumer replica can only be updated by one other replica at a time. Meanwhile, the other replication agreements are idle. Configuring too many replication agreements can also have a negative impact on overall performance. This ensures domain replication within the data center. This ensures domain replication between data centers. If data centers A and B have a replication agreement from A1 to B1, having a replication agreement from A2 to B2 ensures that if one of the servers is down, the replication can continue between the two data centers. The figures below show examples of Identity Management topologies based on the guidelines for creating a reliable topology. 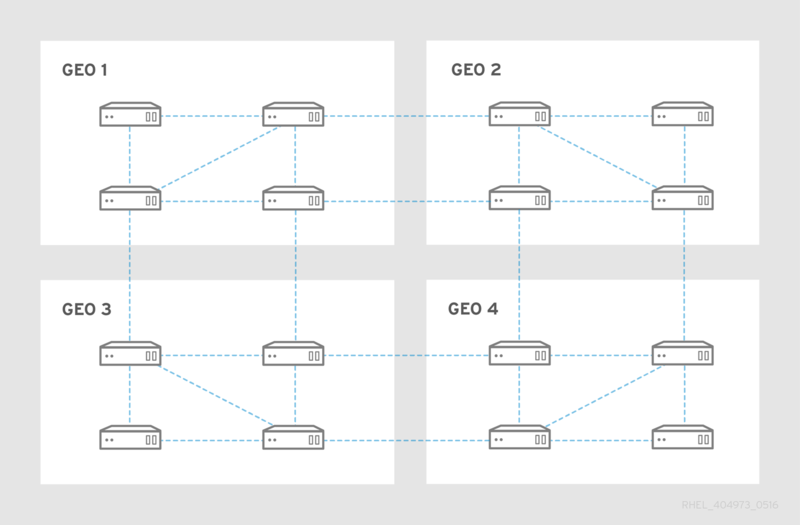 Figure 2.2, “Replica Topology Example 1” shows four data centers, each with four servers. The servers are connected with replication agreements. Figure 2.3, “Replica Topology Example 2” shows three data centers, each with a different number of servers. The servers are connected with replication agreements. The following sections introduce the options for integrating Red Hat Enterprise Linux with Active Directory. For an overview of direct integration, see Section 3.1, “Direct integration”. For an overview of indirect integration, see Section 3.2, “Indirect integration”. For advice on how to decide between them, see Section 3.3, “Deciding between indirect and direct integration”. SSSD can connect a Linux system with various identity and authentication stores: Active Directory, Identity Management, or a generic LDAP or Kerberos server. When integrating with Active Directory, SSSD works only within a single AD forest by default. For multi-forest setup, configure manual domain enumeration. Remote Active Directory forests must trust the local forest to ensure that the idmap_ad plug-in handles remote forest users correctly. SSSD supports both direct and indirect integration. It also enables switching from one integration approach to the other without significant migration costs. The Winbind component of the Samba suite emulates a Windows client on a Linux system and communicates with Active Directory servers. Direct integration with Winbind in a multi-forest Active Directory setup requires bidirectional trusts. A bidirectional path from the local domain of a Linux system must exist to the domain of a user in a remote Active Directory forest to allow full information about the user from the remote Active Directory domain to be available to the idmap_ad plug-in. SSSD satisfies most of the use cases for AD integration and provides a robust solution as a generic gateway between a client system and different types of identity and authentication providers - AD, IdM, Kerberos, and LDAP. Winbind is recommended for deployment on those AD domain member servers on which you plan to deploy Samba FS. In indirect integration, Linux systems are first connected to a central server which is then connected to Active Directory. Indirect integration enables the administrator to manage Linux systems and policies centrally, while users from Active Directory can transparently access Linux systems and services. The Identity Management server acts as the central server to control Linux systems. A cross-realm Kerberos trust with Active Directory is established, enabling users from Active Directory to log on to access Linux systems and resources. Identity Management presents itself to Active Directory as a separate forest and takes advantage of the forest-level trusts supported by Active Directory. Active Directory users can access Identity Management resources. Identity Management servers and clients can resolve the identities of Active Directory users and groups. Active Directory users and groups access Identity Management under the conditions defined by Identity Management, such as host-based access control. Active Directory users and groups continue being managed on the Active Directory side. This approach is based on the WinSync tool. A WinSync replication agreement synchronizes user accounts from Active Directory to Identity Management. WinSync is no longer actively developed in Red Hat Enterprise Linux 8. The preferred solution for indirect integration is cross-forest trust. Groups are not synchronized from Identity Management to Active Directory. Users are duplicated in Active Directory and Identity Management. WinSync supports only a single Active Directory domain. User passwords must be synchronized, which requires the PassSync component to be installed on all domain controllers in the Active Directory domain. After configuring the synchronization, all Active Directory users must manually change passwords before PassSync can synchronize them. The guidelines in this section can help decide which type of integration fits your use case. If you connect less than 30-50 systems, consider direct integration. Indirect integration might introduce unnecessary overhead. If you connect more than 30-50 systems, consider indirect integration with Identity Management. With this approach, you can benefit from the centralized management for Linux systems. In this scenario, consider indirect integration to avoid having to migrate the environment later. If you deploy new systems rarely and they are usually bare metal systems, consider direct integration. In such cases, direct integration is usually simplest and easiest. If you deploy new systems often and they are usually virtual systems provisioned on demand, consider indirect integration. With indirect integration, you can use a central server to manage the new systems dynamically and integrate with orchestration tools, such as Red Hat Satellite. Do your internal policies state that all users must authenticate against Active Directory? You can choose either direct or indirect integration. If you use indirect integration with a trust between Identity Management and Active Directory, the users that access Linux systems authenticate against Active Directory. Policies that exist in Active Directory are executed and enforced during authentication. Active Directory and Identity Management are two alternative environments managing a variety of core services, such as Kerberos, LDAP, DNS, and certificate services. A cross-forest trust relationship transparently integrates these two diverse environments by enabling all core services to interact seamlessly. The following sections provide advice on how to plan and design a cross-forest trust deployment. In a pure Active Directory environment, a cross-forest trust connects two separate Active Directory forest root domains. When you create a cross-forest trust between Active Directory and Identity Management, the Identity Management domain presents itself to Active Directory as a separate forest with a single domain. A trust relationship is then established between the Active Directory forest root domain and the Identity Management domain. As a result, users from the Active Directory forest can access the resources in the Identity Management domain. Identity Management can establish a trust with one Active Directory forest or multiple unrelated forests. 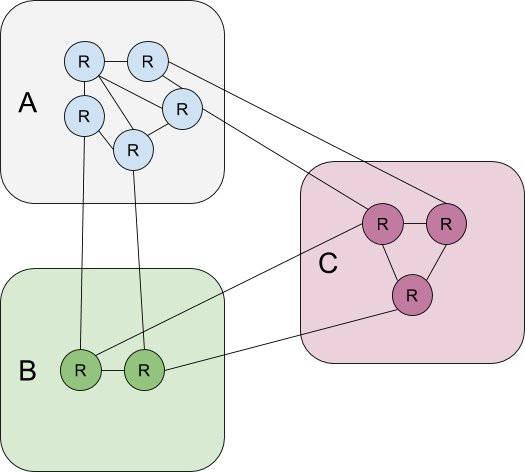 Two separate Kerberos realms can be connected in a cross-realm trust. However, a Kerberos realm only concerns authentication, not other services and protocols involved in identity and authorization operations. Therefore, establishing a Kerberos cross-realm trust is not enough to enable users from one realm to access resources in another realm. An external trust is a trust relationship between Identity Management and an Active Directory domain. While a forest trust always requires establishing a trust between Identity Management and the root domain of an Active Directory forest, an external trust can be established from Identity Management to any domain within a forest. Identity Management servers that can perform identity lookups against Active Directory domain controllers. Trust agents that also run the Samba suite. Active Directory domain controllers contact trust controllers when establishing and verifying the trust to Active Directory. The first trust controller is created when you configure the trust. Trust controllers run more network-facing services than trust agents, and thus present a greater attack surface for potential intruders. In addition to trust agents and controllers, the Identity Management domain can also include standard Identity Management servers. However, these servers do not communicate with Active Directory. Therefore, clients that communicate with the standard servers cannot resolve Active Directory users and groups or authenticate and authorize Active Directory users. Configure at least two trust controllers per Identity Management deployment. Configure at least two trust controllers in each data center. If you ever want to create additional trust controllers or if an existing trust controller fails, create a new trust controller by promoting a trust agent or a standard server. To do this, use the ipa-adtrust-install utility on the Identity Management server. You cannot downgrade an existing trust controller to a trust agent. In one way trusts, Identity Management (IdM) trusts Active Directory (AD) but AD does not trust IdM. AD users can access resources in the IdM domain but users from IdM cannot access resources within the AD domain. The IdM server connects to AD using a special account, and reads identity information that is then delivered to IdM clients over LDAP. In two way trusts, IdM users can authenticate to AD, and AD users can authenticate to IdM. AD users can authenticate to and access resources in the IdM domain as in the one way trust case. IdM users can authenticate but cannot access most of the resources in AD. They can only access those Kerberized services in AD forests that do not require any access control check. To be able to grant access to the AD resources, IdM needs to implement the Global Catalog service. This service does not yet exist in the current version of the IdM server. Because of that, a two-way trust between IdM and AD is nearly functionally equivalent to a one-way trust between IdM and AD. Identity Management uses LDAP for managing groups. Active Directory entries are not synchronized or copied over to Identity Management, which means that Active Directory users and groups have no LDAP objects in the LDAP server, so they cannot be directly used to express group membership in the Identity Management LDAP. For this reason, administrators in Identity Management need to create non-POSIX external groups, referenced as normal Identity Management LDAP objects to signify group membership for Active Directory users and groups in Identity Management. Security IDs (SIDs) for non-POSIX external groups are processed by SSSD, which maps the SIDs of groups in Active Directory to POSIX groups in Identity Management. In Active Directory, SIDs are associated with user names. When an Active Directory user name is used to access Identity Management resources, SSSD uses the user’s SID to build up a full group membership information for the user in the Identity Management domain. These guidelines can help you achieve the right DNS configuration for establishing a cross-forest trust between Identity Management and Active Directory. The most convenient management solution is an environment where each DNS domain is managed by integrated DNS servers, but you can also use any other standard-compliant DNS server. Systems joined to Identity Management can be distributed over multiple DNS domains. Ensure the DNS domains that contain Identity Management clients do not overlap with DNS domains that contain systems joined to Active Directory. Ensure the primary Identity Management DNS domain has proper SRV records to support Active Directory trusts. For other DNS domains that are part of the same Identity Management realm, the SRV records do not have to be configured when the trust to Active Directory is established. The reason is that Active Directory domain controllers do not use SRV records to discover Kerberos key distribution centers (KDCs) but rather base the KDC discovery on name suffix routing information for the trust. When configuring the Identity Management DNS, follow the instructions described in Chapter 7, Installing an Identity Management server: With integrated DNS, with an external CA. If you are using Identity Management without integrated DNS, follow the instructions described in Chapter 9, Installing an Identity Management server: Without integrated DNS, with an integrated CA. Ensure Kerberos realm names are the same as the primary DNS domain names, with all letters uppercase. For example, if the domain names are ad.example.com for Active Directory and idm.example.com for Identity Management, the Kerberos realm names must be AD.EXAMPLE.COM and IDM.EXAMPLE.COM. In the domain name linux.example.com, the NetBIOS name is linux. In the domain name example.com, the NetBIOS name is example. Ensure the Identity Management and Active Directory domains have different NetBIOS names. The NetBIOS name is critical for identifying the Active Directory domain. If the Identity Management domain is within a subdomain of the Active Directory DNS, the NetBIOS name is also critical for identifying the Identity Management domain and services. The maximum length of a NetBIOS name is 15 characters. Server discovery and affinity configuration affects which Active Directory servers an Identity Management client communicates with. This section provides an overview of how discovery and affinity work in an environment with a cross-forest trust between Identity Management and Active Directory. By default, clients use automatic service lookup based on the DNS records. In this setup, you can also use the DNS locations feature to configure DNS-based service discovery. The embedded client on an Identity Management server works also as a client of the Active Directory server. It can automatically discover and use the appropriate Active Directory site. When the embedded client performs the discovery, it might first discover an Active Directory server in a remote location. If the attempt to contact the remote server takes too long, the client might stop the operation without establishing the connection. Use the dns_resolver_timeout option in the sssd.conf file on the client to increase the amount of time for which the client waits for a reply from the DNS resolver. See the sssd.conf(5) man page for details. Once the embedded client has been configured to communicate with the local Active Directory servers, the System Security Services Daemon (SSSD) remembers the Active Directory site the embedded client belongs to. Thanks to this, SSSD normally sends an LDAP ping directly to a local domain controller to refresh its site information. If the site no longer exists or the client has meanwhile been assigned to a different site, SSSD starts querying for SRV records in the forest and goes through a whole process of autodiscovery. Using trusted domain sections in sssd.conf, you can also expicitly override some of the information that is discovered automatically by default. Table 4.2, “Operations performed from an Identity Management trust controller towards Active Directory domain controllers” shows which operations and requests are performed during the creation of an Identity Management to Active Directory trust from the Identity Management trust controller towards Active Directory domain controllers. Table 4.3, “Operations performed from an Active Directory domain controller towards Identity Management trust controllers” shows which operations and requests are performed during the creation of an Identity Management to Active Directory trust from the Active Directory domain controller towards Identity Management trust controllers. The following sections list the requirements to install an Identity Management server. Before the installation, make sure your system meets these requirements. For larger deployments, it is more effective to increase the RAM than to increase disk space because much of the data is stored in cache. A basic user entry or a simple host entry with a certificate is approximately 5—​10 kB in size. Install an Identity Management server on a clean system without any custom configuration for services such as DNS, Kerberos, Apache, or Directory Server. The Identity Management server installation overwrites system files to set up the Identity Management domain. Identity Management backs up the original system files to /var/lib/ipa/sysrestore/. When an Identity Management server is uninstalled at the end of the lifecycle, these files are restored. The IdM system must have the IPv6 protocol enabled in the kernel. If IPv6 is disabled, then the CLDAP plug-in used by the IdM services fails to initialize. IPv6 does not have to be enabled on the network. This section lists the host name and DNS requirements for server and replica systems. It also shows how to verify that the systems meet the requirements. The requirements in this section apply to all Identity Management servers, those with integrated DNS and those without integrated DNS. This requirement applies to Identity Management servers with and without integrated DNS. The host name must be a fully qualified domain name, such as server.example.com. It is a valid DNS name, which means only numbers, alphabetic characters, and hyphens (-) are allowed. Other characters, such as underscores (_), in the host name cause DNS failures. It is all lower-case. No capital letters are allowed. It does not resolve to the loopback address. It must resolve to the system’s public IP address, not to 127.0.0.1. The output of hostname must not be localhost or localhost6. Verify the forward DNS configuration using the dig utility. If dig does not return any output for the AAAA record, it does not indicate incorrect configuration. No output only means that no IPv6 address is configured in DNS for the system. If you do not intend to use the IPv6 protocol in your network, you can proceed with the installation in this situation. Verify the reverse DNS configuration (PTR records). Use the dig utility and add the IP address. If the commands below display a different host name or no host name, even though dig +short server_host_name in the previous step returned an IP address, it indicates that the reverse DNS configuration is incorrect. If dig +short server.example.com AAAA in the previous step did not display any IPv6 address, querying the AAAA record does not output anything. In this case, this is normal behavior and does not indicate incorrect configuration. If any of these items is missing from the output, inspect the documentation for your DNS forwarder and verify that EDNS0 and DNSSEC are supported and enabled. In the latest versions of the BIND server, the dnssec-enable yes; option must be set in the /etc/named.conf file. Do not modify the /etc/hosts file manually. If /etc/hosts has been modified manually before, make sure its contents conform to the following rules. It properly lists the IPv4 and IPv6 localhost entries for the host. These entries are followed by the Identity Management server IP address and host name as the first entry. Note that the Identity Management server host name cannot be part of the localhost entry. Identity Management uses a number of ports to communicate with its services. These ports must be open and available for incoming connections to the Identity Management server for Identity Management to work. They must not be currently used by another service or blocked by a firewall. In addition, ports 8080, 8443, and 749 must be free as they are used internally. Do not open these ports and instead leave them blocked by a firewall. Make sure the firewalld service is running. For details on using firewall-cmd to open ports on a system, see the firewall-cmd(1) man page. Optional. To verify that the ports are available now, use the nc, telnet, or nmap utilities to connect to a port or run a port scan. Note that you also have to open network-based firewalls for both incoming and outgoing traffic. In RHEL8, the packages necessary for installing an Identity Management (IdM) server are shipped as a module. The IdM server module stream is called the DL1 stream, and you need to enable this stream before downloading packages from this stream. The following procedure shows how to download the packages necessary for setting up the Identity Management environment of your choice. The IdM client packages installed from the idm:DL1 stream are likely to be of a lower version that the IdM client packages installed from the default idm:client stream. While it is possible to install packages from modules individually, be aware that if you install any package from a module that is not listed as "API" for that module, it is only going to be supported by Red Hat in the context of that module. For example, if you install bind-dyndb-ldap directly from the repository to use with your custom 389 Directory Server setup, any problems that you have will be ignored unless they occur for Identity Management, too. You can automate much of the maintenance and DNS record management using native Identity Management tools. For example, DNS SRV records are automatically created during the setup, and later on are automatically updated. You can have a stable connection with the rest of the Internet by setting up global forwarders during the installation of the Identity Management server. Global forwarders are also useful for trusts with Active Directory. You can set up a DNS reverse zone to prevent emails from your domain to be considered spam by email servers outside of the Identity Management domain. Identity Management DNS is not meant to be used as a general-purpose DNS server. Some of the advanced DNS functions are not supported. This chapter describes how you can install a new Identity Management server with an integrated CA as the root CA. The default configuration for the ipa-server-install command is an integrated CA as the root CA. If no CA option, for example --external-ca or --ca-less is specified, the Identity Management server is installed with an integrated CA. During the interactive installation using the ipa-server-install utility, you are asked to supply basic configuration of the system, for example the realm, the administrator’s password and the Directory Manager’s password. The ipa-server-install installation script creates a log file at /var/log/ipaserver-install.log. If the installation fails, the log can help you identify the problem. The script prompts to configure an integrated DNS service. Enter yes. The script prompts for several required settings and offers recommended default values in brackets. To accept a default value, press Enter. To provide a custom value, enter the required value. Plan these names carefully. You will not be able to change them after the installation is complete. Enter the passwords for the Directory Server superuser (cn=Directory Manager) and for the Identity Management administration system user account (admin). The script prompts for DNS forwarders. To configure DNS forwarders, enter yes, and then follow the instructions on the command line. The installation process will add the forwarder IP addresses to the /etc/named.conf file on the installed Identity Management server. For the forwarding policy default settings, see the --forward-policy description in the ipa-dns-install(1) man page. If you do not want to use DNS forwarding, enter no. With no DNS forwarders, your environment will be isolated, and names from other DNS domains in your infrastructure will not be resolved. The script prompts to check if any DNS reverse (PTR) records for the IP addresses associated with the server need to be configured. If you run the search and missing reverse zones are discovered, the script asks you whether to create the reverse zones along with the PTR records. Using Identity Management to manage reverse zones is optional. You can use an external DNS service for this purpose instead. Enter yes to confirm the server configuration. The installation script now configures the server. Wait for the operation to complete. After the installation script completes, add DNS delegation from the parent domain to the Identity Management DNS domain. For example, if the Identity Management DNS domain is ipa.example.com, add a name server (NS) record to the example.com parent domain. Repeat this step each time after an Identity Management DNS server is installed. For a complete list of options accepted by ipa-server-install, run the ipa-server-install --help command. This chapter describes how you can install a new Identity Management server with an external CA as the root CA. Decide on the type of the external CA you use (the --external-ca-type option). See the ipa-server-install(1) man page for details. Run the ipa-server-install utility with the --external-ca option. If you are using the Microsoft Certificate Services CA, use also the --external-ca-type option. For details, see the ipa-server-install(1) man page. The script prompts to configure an integrated DNS service. Enter yes or no. In this procedure, we are installing a server with integrated DNS. If you want to install a server without integrated DNS, the installation script will not prompt you for DNS configuration as described in the steps below. See Chapter 9, Installing an Identity Management server: Without integrated DNS, with an integrated CA for details on the steps for installing a server without DNS. Submit the CSR located in /root/ipa.csr to the external CA. The process differs depending on the service to be used as the external CA. Retrieve the issued certificate and the CA certificate chain for the issuing CA in a base 64-encoded blob (either a PEM file or a Base_64 certificate from a Windows CA). Again, the process differs for every certificate service. Usually, a download link on a web page or in the notification email allows the administrator to download all the required certificates. Be sure to get the full certificate chain for the CA, not just the CA certificate. This failure occurs when the *_proxy environmental variables are set. For a solution of the problem, see Section 7.2, “Troubleshooting: External CA installation fails”. This chapter describes how you can install a new Identity Management server without a certificate authority (CA). You cannot install a server or replica using self-signed third-party server certificates because the imported certificate files must contain the full CA certificate chain of the CA that issued the LDAP and Apache server certificates. The files provided using --dirsrv-cert-file and --http-cert-file must contain exactly one server certificate and exactly one private key. The contents of the files provided using --dirsrv-cert-file and --http-cert-file are often identical. --ca-cert-file for the file or files containing the CA certificate of the CA that issued the LDAP, Apache Server, and Kerberos KDC certificates. Use this option if the CA certificate is not present in the certificate files provided by the other options. The files provided using --dirsrv-cert-file and --http-cert-file combined with the file provided using --ca-cert-file must contain the full CA certificate chain of the CA that issued the LDAP and Apache server certificates. If you do not provide the PKINIT certificate, ipa-server-install configures the IdM server with a local KDC with a self-signed certificate. For details on what the certificate file formats these options accept, see the ipa-server-install(1) man page. See Section 8.1, “Certificates required to install an Identity Management server without a CA” for details on the provided certificates. This chapter describes how you can install a new Identity Management server without integrated DNS. The script prompts to configure an integrated DNS service. Press Enter to select the default no option. As an administrator, you can remove an Identity Management server from the topology. This procedure describes how you can uninstall an example server named server.example.com. Before uninstalling a server that serves as a certificate authority (CA), key recovery authority (KRA), or DNS server, make sure these services are running on another server in the domain. Removing the last server that serves as a CA, KRA, or DNS server seriously disrupts the Identity Management functionality. Make sure all name server (NS) DNS records pointing to server.example.com are deleted from your DNS zones. This applies regardless of whether you use integrated DNS managed by Identity Management or external DNS. You cannot change the host name of an existing Identity Management server. However, you can replace the server with a replica of a different name. Install a new replica that will replace the existing server, ensuring the replica has the required host name and IP address. For details, see Chapter 19, Installing an Identity Management replica. If the server you are uninstalling is a CRL master server, make another server the CRL master server before proceeding. Stop the existing Identity Management server instance. Uninstall the existing server as described in Chapter 10, Uninstalling an Identity Management server. This chapter describes the conditions your system must meet to install an Identity Management client. Client installer by default tries to search for _ldap._tcp.DOMAIN DNS SRV records for all domains that are parent to its hostname. For example, if a client machine has a hostname client1.idm.example.com, the installer will try to retrieve an Identity Management server hostname from _ldap._tcp.idm.example.com, _ldap._tcp.example.com and _ldap._tcp.com DNS SRV records, respectively. The discovered domain is then used to configure client components (for example, SSSD and Kerberos 5 configuration) on the machine. However, the hostnames of Identity Management clients are not required to be part of the primary DNS domain. If the client machine hostname is not in a subdomain of an Identity Management server, pass the IdM domain as the --domain option of the ipa-client-install command. In that case, after the installation of the client, both SSSD and Kerberos components will have the domain set in their configuration files and will use it to autodiscover Identity Management servers. For details on DNS requirements in Identity Management, see Section 5.3, “Host name and DNS requirements for Identity Management”. Identity Management clients connect to a number of ports on Identity Management servers to communicate with their services. On Identity Management client, these ports must be open in the outgoing direction. If you are using a firewall that does not filter outgoing packets, such as firewalld, the ports are already available in the outgoing direction. For information about which specific ports are used, see Section 5.4, “Port requirements for Identity Management”. In RHEL8, the packages necessary for installing an Identity Management client are shipped as a module. The client stream is the default stream of the idm module, and you do not need to enable the stream before downloading the packages. You do need to enable the idm:client stream if you previously enabled the idm:DL1 stream. The following sections describe how to configure a system as an Identity Management (IdM) client by using the ipa-client-install utility. Configuring a system as an IdM client enrolls it into an IdM domain and enables the system to use IdM services on IdM servers in the domain. For installing a client interactively using privileged user’s credentials, see Section 13.3, “Installing a client by using user credentials: Interactive installation”. For installing a client interactively using a one-time password, see Section 13.4, “Installing a client by using a one-time password: Interactive installation”. For installing a client noninteractively using either a privileged user’s credentials, a one-time password or a keytab from previous enrollment, see Section 13.5, “Installing a client: Non-interactive installation”. Before you start installing the Identity Management client, make sure that you have met all the prerequisites. See Chapter 12, Preparing the system for Identity Management client installation. The credentials of a user authorized to enroll clients. This is the default option expected by ipa-client-install. To provide the credentials of an authorized user directly to ipa-client-install, use the --principal and --password options. See Section 13.3, “Installing a client by using user credentials: Interactive installation” for a detailed procedure. To use this authentication method, add the --random option to ipa-client-install option. See Section 13.4, “Installing a client by using a one-time password: Interactive installation” for a detailed procedure. This option is available if the system was previously enrolled as an Identity Management client. To use this authentication method, add the --keytab option to ipa-client-install. See Chapter 15, Re-enrolling an Identity Management client for details. For details on the options accepted by ipa-client-install, see the ipa-client-install(1) man page. This procedure describes installing an Identity Management client interactively by using the credentials of an authorized user to enroll the system into the domain. Ensure you have the credentials of a user authorized to enroll clients into the Identity Management domain. This could be, for example, a hostadmin user with the Enrollment Administrator role. Run the ipa-client-install utility on the system that you want to configure as an Identity Management client. The installation script attempts to obtain all the required settings, such as DNS records, automatically. If the SRV records are set properly in the IdM DNS zone, the script automatically discovers all the other required values and displays them. Enter yes to confirm. If the script fails to obtain some settings automatically, it prompts you for the values. Only numbers, alphabetic characters, and hyphens (-) are allowed. For example, underscores are not allowed and can cause DNS failures. The host name must be all lower-case. No capital letters are allowed. The installation script now configures the client. Wait for the operation to complete. For details on how the client installation script searches for the DNS records, see the DNS Autodiscovery section in the ipa-client-install(1) man page. This procedure describes installing an Identity Management client interactively by using a one-time password to enroll the system into the domain. On a server in the domain, add the future client system as an Identity Management host. Use the --random option with the ipa host-add command to generate a one-time random password for the enrollment. The generated password will become invalid after you use it to enroll the machine into the Identity Management domain. It will be replaced with a proper host keytab after the enrollment is finished. Run the ipa-client-install utility on the system that you want to configure as an Identity Management client. Use the --password option to provide the one-time random password. Because the password often contains special characters, enclose it in single quotes ('). For a non-interactive installation, you must provide all required information to the ipa-client-install utility using command-line options. The following sections describe the minimum required options for a non-interactive installation. For details, see Section 13.2, “An overview of the Identity Management client installation options”. The --unattended lets the installation run without requiring user confirmation. For a complete list of options accepted by ipa-client-install, see the ipa-client-install(1) man page. The Command-Line Interface informs you that the ipa-client-install was successful, but you can also do your own test. Table 13.1, “Requests performed during an Identity Management client installation” lists the operations performed by ipa-client-install, the Identity Management (IdM) client installation tool. The browser-based web UI is optional. Table 13.2, “CLI post-installation operations” shows the operations performed by the CLI during an IdM client post-installation deployment. Table 13.3, “webUI post-installation operations” shows the operations performed by the web UI during an IdM client post-installation deployment. Two daemons run on the IdM client, the System Security Services Daemon (SSSD) and certmonger. Section 13.9.1, “SSSD communication patterns” and Section 13.9.2, “Certmonger communication patterns” describe how these daemons communicate with the services available on the IdM and Active Directory servers. The System Security Services Daemon (SSSD) is a system service to access remote directories and authentication mechanisms. If configured on an IdM client, it connects to the IdM server, which provides authentication, authorization and other identity and policy information. If the IdM server is in a trust relationships with Active Directory (AD), SSSD also connects to AD to perform authentication for AD users using the Kerberos protocol. By default, SSSD uses Kerberos to authenticate any non-local user. In special situations, SSSD might be configured to use the LDAP protocol instead. The System Security Services Daemon (SSSD) can be configured to communicate with multiple servers. Table 13.4, “Communication patterns of SSSD on IdM clients when talking to IdM servers” and Table 13.5, “Communication patterns of SSSD on IdM servers acting as trust agents when talking to Active Directory Domain Controllers” show common communication patterns for SSSD in IdM. (optionally) In case of smart-card authentication, requests to the Online Certificate Status Protocol (OCSP) responder, if it is configured. This often is done via port 80, but it depends on the actual value of the OCSP responder URL in a client certificate. Certmonger is a daemon running on IdM masters and IdM clients to allow a timely renewal of SSL certificates associated with the services on the host. The Table 13.6, “Certmonger communication patterns” shows the operations performed by IdM client’s certmonger utility on IdM masters. A Kickstart enrollment automatically adds a new system to the Identity Management domain at the time Red Hat Enterprise Linux is installed. This procedure describes how to use a Kickstart file to install an Identity Management client. Do not start the sshd service prior to the kickstart enrollment. Starting sshd before enrolling the client generates the SSH keys automatically, but the Kickstart file in Section 14.2, “Kickstart file for client installation” uses a script for the same purpose, which is the preferred solution. Create a Kickstart file with the contents described in Section 14.2, “Kickstart file for client installation”. Make sure that network is configured properly in the Kickstart file using the network command. Use the Kickstart file to install the Identity Management client. This section describes the contents of a kickstart file that you can use to install an Identity Management client. The password which you set when pre-creating the client host on the Identity Management server. in Section 14.1, “Installing a client with Kickstart”. For a non-interactive installation, add the --unattended option to ipa-client-install. If a client virtual machine has been destroyed and lost connection with the Identity Management (IdM) servers, for example due to the client’s hardware failure, and you still have its keytab, you can re-enroll the client. In this scenario, you want to get the client back in the IdM environment with the same hostname. During the re-enrollment, the client generates new certificates, but the identity of the client in the LDAP database remains unchanged. After the re-enrollment, the host has its keys and other information in the same LDAP object with the same fqdn as previously, before the machine’s loss of connection with the IdM servers. You cannot re-enroll a client after you have renamed it. This is because in Identity Management, the key attribute of the client’s entry in LDAP is the client’s hostname, its fqdn. As opposed to re-enrolling a client, during which the client’s LDAP object remains unchanged, the outcome of renaming a client is that the client has its keys and other information in a different LDAP object with a new fqdn. Thus the only way to rename a client is to uninstall the host from IdM, change the host’s hostname, and install it as an IdM client with a new name. For details on how to rename a client, see Chapter 17, Renaming Identity Management client systems. This procedure describes re-enrolling an Identity Management client interactively by using the credentials of an authorized user. For a more detailed procedure on enrolling clients by using an authorized user’s credentials, see Section 13.3, “Installing a client by using user credentials: Interactive installation”. Back up the original client keytab file, for example in the /tmp or /root directory. This procedure describes re-enrolling an Identity Management client non-interactively by using the keytab of the client system. For example, re-enrollment using the client keytab is appropriate for an automated installation. Copy the keytab file from the backup location to the /etc/ directory on the re-created client machine. As an administrator, you can remove an Identity Management client from the environment. Uninstalling a client removes the client from the Identity Management domain, along with all of the specific Identity Management configuration of system services, such as System Security Services Daemon (SSSD). This restores the previous configuration of the client system. No option to delete specific record provided. The following sections describe how to change the host name of an Identity Management client system. Renaming a client is a manual procedure. Do not perform it unless changing the host name is absolutely required. Before uninstalling the current client, make note of certain settings for the client. You will apply this configuration after re-enrolling the machine with a new host name. In addition, each host has a default host service which does not appear in the ipa service-find output. The service principal for the host service, also called a host principal, is host/old-client-name.example.com. # find / -name "*.keytab"
Each service on the client system has a Kerberos principal in the form service_name/host_name@REALM, such as ldap/old-client-name.example.com@EXAMPLE.COM. Identify all host groups to which the machine belongs. You can now re-install the Identity Management client to the Identity Management domain with the new host name. Install an client on your renamed host following the procedure described in Chapter 13, Installing an Identity Management client: Basic scenario. On the Identity Management server, add a new keytab for every service identified in Section 17.1, “Prerequisites”. Re-add the client to the host groups identified in Section 17.1, “Prerequisites”. The following sections list the requirements to install an Identity Management replica. Before the installation, make sure your system meets these requirements. Red Hat Enterprise Linux (RHEL) 8 replicas only work with IdM masters running on RHEL 7.4 and later. Before introducing IdM replicas running on RHEL 8 into an existing deployment, upgrade all IdM servers to RHEL 7.4 or later, and change the domain level to 1. The master server is installed on Red Hat Enterprise Linux 8 and uses the Identity Management 4.x packages. You must install the replica also on Red Hat Enterprise Linux 8 or later and use Identity Management version 4.x or later. This ensures that configuration can be properly copied from the server to the replica. The following sections describe how to install an Identity Management replica based on an existing server. The replica installation process copies the configuration of the existing server, and installs the replica based on that configuration. Install one Identity Management replica at a time. The installation of multiple replicas at the same time is not supported. When installing a replica on an existing client, choose one of the following authorization methods. Let Identity Management prompt you for the credentials interactively. This is the default behavior. Choose this method to authorize the replica installation by adding the client to the ipaservers host group. Membership in ipaservers grants the machine elevated privileges analogous to the administrator’s credentials. When you run the ipa-replica-install utility on a system that has not yet been enrolled in the Identity Management domain, ipa-replica-install first enrolls the system as a client and then installs the replica components. When installing a replica on a system outside the Identity Management domain, choose one of the following authorization methods. Using this method, the replica installation is authorized by providing a privileged user’s credentials. The default privileged user is admin. To use this method, add the principal name and password options (--principal admin --admin-password password) to ipa-replica-install directly during the installation. Using this method, the replica installation is authorized by providing a random password for one-time enrollment. Without a certificate authority (CA) in an Identity Management (IdM) environment in which a CA is already installed. The replica will forward all certificate operations to the Identity Management IdM server with a CA installed. --forwarder to specify a forwarder, or --no-forwarder if you do not want to use any forwarders. To specify multiple forwarders for failover reasons, use --forwarder multiple times. When configuring a replica with a CA, the CA configuration of the replica must mirror the CA configuration of the master server. For example, if the server includes an integrated Identity Management CA as the root CA, the replica must also be installed with an integrated CA as the root CA. No other CA configuration is available in this case. The inclusion of the --setup-ca option in the ipa-replica-install command takes care of copying the CA configuration of the initial server. Without a certificate authority (CA) by providing the required certificates manually. The assumption here is that the master server was also installed without a CA. For details about the files that are provided using these options, see Section 8.1, “Certificates required to install an Identity Management server without a CA”. After creating a replica, check if the replica replicates data as expected. You can use the following procedure. Table 19.1, “Requests performed during an Identity Management replica installation” lists the operations performed by ipa-replica-install, the Identity Management (IdM) replica installation tool. By configuring Identity Management (IdM), IdM system administrators can enable users to authenticate to the IdM web UI and command-line interface (CLI) using a certificate that a Certificate Authority (CA) has issued to the users. Authenticating using a certificate can be very convenient and fast, as the user is not prompted for any password. The web browser can run on a system that is not part of the IdM domain. 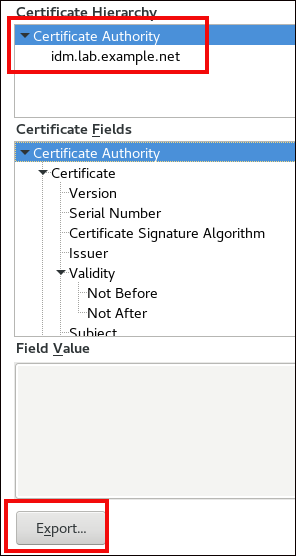 you can skip Section 21.3, “Making sure the certificate and user are linked together” if the user’s certificate has been issued by the IdM CA. Only Identity Management users can log into the web UI using a certificate. Active Directory users can log in with their user name and password. As an Identity Management (IdM) administrator, you can allow users to use certificates to authenticate to your IdM environment. On an Identity Management server, obtain administrator privileges and create a shell script to configure the server. Do not forget to run the script on each new replica that you add to the system in the future if you want to have certificate authentication for users enabled in the whole topology. As an Identity Management (IdM) administrator, you can create certificates for users in your IdM environment and export them to the IdM clients on which you want to enable certificate authentication for users. You can skip this section if the user you want to authenticate using a certificate already has a certificate. You can skip this section if the user’s certificate has been issued by the IdM CA. For certificate authentication to work, you need to make sure that the certificate is linked to the user that will use it to authenticate to Identity Management (IdM). If the certificate is provided by a Certificate Authority that is not part of your Identity Management environment, link the user and the certificate following the procedure described in Linking User Accounts to Certificates. If the certificate is provided by Identity Management CA, the certificate is already automatically added in the user entry and you do not have to link the certificate to the user account. For details on creating a new certificate in IdM, see Section 21.2, “Requesting a new user certificate and exporting it to the client”. For certificate authentication to work in your Identity Management web UI, you need to import the user and Certificate Authority (CA) certificates into the Mozilla Firefox or Google Chrome browser running on the host on which you want to enable certificate authentication. The host itself does not have to be part of the IdM domain. The following procedure shows how to configure the Mozilla Firefox 57.0.1 browser. Open Firefox, then navigate to Preferences → Privacy & Security. In the Your Certificates tab, click Import. Locate and open the certificate of the user in the PKCS12 format, then click OK and OK.
Navigate to the IdM web UI by writing the name of your IdM server in the Firefox address bar. Click Advanced on the Insecure Connection warning page. In the Details tab, highlight the Certificate Authority fields. Click Export. Save the CA certificate, for example as the CertificateAuthority.crt file, then click Close, and Cancel. Open Firefox, navigate to Preferences and click Privacy & Security. In the Authorities tab, click Import. Locate and open the CA certificate that you saved in the previous step in the CertificateAuthority.crt file. Trust the certificate to identify websites, then click OK and OK.
Continue to Section 21.5, “Authenticating to the Identity Management Web UI with a Certificate as an Identity Management User”. This procedure describes authenticating as a user to the Identity Management (IdM) web UI using a certificate stored on the desktop of an Identity Management client. In the browser, navigate to the Identity Management web UI at, for example, https://server.idm.example.com/ipa/ui. The user’s certificate should already be selected. Uncheck Remember this decision, then click OK.
You are now authenticated as the user who corresponds to the certificate. If the authentication fails, see Investigating Smart Card Authentication Failures in the Linux Domain Identity, Authentication, and Policy Guide. For information about authenticating to the IdM web UI using a certificate stored on a smart card, see Managing Smart Card Links in the Identity Management Server in the Linux Domain Identity, Authentication, and Policy Guide. To make certificate authentication work for an IdM user in the Command Line Interface (CLI) of your IdM client, import the IdM user’s certificate and the private key to the IdM client. For details on creating and transferring the user certificate, see Section 21.2, “Requesting a new user certificate and exporting it to the client”. In Red Hat Enterprise Linux (RHEL) 7, external group membership allows AD users and groups to access IdM resources in a POSIX environment with the help of the System Security Services Daemon (SSSD). The IdM LDAP server has its own mechanisms to grant access control. RHEL 8 introduces an update that allows adding an ID user override for an AD user as a member of an IdM group. An ID override is a record describing what a specific Active Directory user or group properties should look like within a specific ID view, in this case the Default Trust View. As a consequence of the update, the IdM LDAP server is able to apply access control rules for the IdM group to the AD user. AD users are now able to use the self service features of IdM UI, for example to upload their SSH keys, or change their personal data. An AD administrator is able to fully administer IdM without having two different accounts and passwords. Currently, selected features in IdM may still be unavailable to AD users. For example, setting passwords for IdM users as an AD user from the IdM admins group might fail. The idm:DL1/adtrust profile is installed on your IdM server. The profile contains all the packages necessary for installing an IdM server that will have a trust agreement with Active Directory, including the ipa-idoverride-memberof package. A working Identity Management environment is set up. For details, see Chapter 5, Preparing the system for Identity Management server installation. A working trust between your Identity Management environment and Active Directory is set up. This procedure describes creating and using an ID override for an Active Directory (AD) user to give that user rights identical to those of an Identity Management (IdM) user. During this procedure, work on an IdM server that is configured as a trust controller or a trust agent. For details on trust controllers and trust agents, see Section 4.2, “Trust controllers and trust agents”. This procedure checks that an Active Directory user can log into Identity Management CLI and run commands appropriate for his role. The destruction of the Kerberos ticket is required because the GSSAPI implementation in MIT Kerberos chooses credentials from the realm of the target service by preference, which in this case is the IdM realm. This means that if a credentials cache collection, namely the KCM:, KEYRING:, or DIR: type of credentials cache is in use, a previously obtained admin or any other IdM principal’s credentials will be used to access the IdM API instead of the AD user’s credentials. This section introduces the session recording solution and its purpose. The session recording solution is provided within Red Hat Enterprise Linux 8 and it is based on the tlog package. The tlog package and its associated Cockpit session player provide you with the ability to record and playback user terminal sessions. You can configure the recording to take place per user or user group via the SSSD service. All terminal input and output is captured and stored in a text-based format in the system journal. Recording of the terminal input is turned off by default to not intercept raw passwords and other sensitive information. The solution can be used for auditing user sessions on security-sensitive systems or, in the event of a security breach, reviewing recorded sessions as part of forensic analysis. System administrators are able to configure session recording locally on RHEL 8.0 systems. You can review the recorded sessions from the Cockpit web-based interface or in a terminal using the tlog-play command. There are three main components key to the session recording solution. The tlog utility, the SSSD service and a Cockpit embedded user interface. The tlog utility is a terminal input/output (I/O) recording and playback program. It inserts itself (specifically the tlog-rec-session tool) between the user terminal and the user shell, and logs everything that passes through as JSON messages. The System Security Services Daemon (SSSD) service provides a set of daemons to manage access to remote directories and authentication mechanisms. 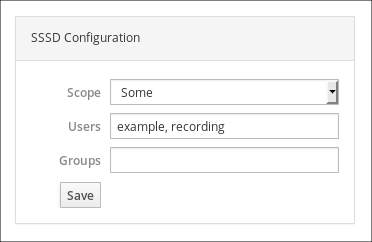 When configuring session recording, you can use SSSD to specify, which users or user groups should tlog record. This can be done either from a command-line interface (CLI) or from the Cockpit web interface. The Session Recording page is part of the Cockpit user interface. Cockpit embedded web interface for session recording enables you to manage recorded sessions. You have to have administrator privileges to be able to access the recorded sessions. In this section we cover how to deploy the session recording solution on a Red Hat Enterprise Linux system. To be able to deploy the session recording solution you need to have the following packages installed: tlog, SSSD, cockpit-session-recording. When you have all the necessary packages installed, you can move on to configuring your recording parameters. If you choose to manage recorded users or user groups with SSSD, which is the recommended option, every user’s original shell will be preserved. The sssd-session-recording.conf file is created automatically once you have opened the configuration page in the Cockpit interface. none to record no sessions. some to record only specified sessions. all to record all sessions. In case you choose some as a scope of recorded users or groups, add their names divided by commas to the file. In the following example users example1 and example2, and group examples have session recording enabled. Second option for specifying recorded users or user groups using SSSD is to list them directly in the Cockpit web interface. Connect to the Cockpit web interface locally by entering localhost:9090 or by entering your IP address <IP_ADDRESS>:9090 to your browser. Log in to the Cockpit web interface. Your user has to have administrator privileges to be able to view te recorded sessions. Go to the Session Recording page in the menu on the left of the interface. Click on the gear button in the right top corner. Set your parameters in the SSSD Configuration table. Names in the Users and Groups lists should be divided by commas. Be aware that this practice is not recommended to use. The preferred option is to configure your recorded users via SSSD either from command-line interface or directly from the Cockpit web interface. If choose to manually change the user’s shell, their working shell will be the one that is listed in the tlog-rec-session.conf configuration file. There are two possibilities for replaying already recorded sessions. The first one is to use the tlog-play tool. The second option is to manage your recorded sessions from the Cockpit web interface. The Cockpit suite has a whole interface for managing recorded sessions. You can choose the session you want to review directly from the Session recording page, where the list of your recorded session is. The Cockpit player supports window resizing. Clicking a specific log under the player window moves you to the respective part of the video. You can slow down or speed up the playback video. You can change between grabbing and selection of text in the recording. You can change size of the recording. Other option for playback of recorded sessions is using the tlog-play tool. The tlog-play tool is a playback program for terminal input and output recorded with the tlog-rec tool. It reproduces the recording of the terminal it is under, but cannot change its site. For this reason the playback terminal needs to match the recorded terminal size for proper playback. The tlog-play tool loads its parameters form the /usr/local/etc/tlog/tlog-play.conf configuration file. The parameters can be overriden with command line options described in the tlog-play manual pages. Recorded sessions can be played back either from a simple file or from Systemd Journal. Generally, you can select Journal log entries for playback using Journal matches and timestamp limits, with the -M or --journal-match, -S or --journal-since, and -U or --journal-until options. In practice however, playback from Journal is usually done with a single match against the TLOG_REC Journal field. The TLOG_REC field contains a copy of the rec field from the logged JSON data, which is a host-unique ID of the recording. You can find further instructions and documentation in the tlog-play manual pages.